With the AAL Forum only a month away, we will be posting a small description of the exhibitors you can expect to see at the event, in the run up to the 24 September. From projects, to industry experts and businesses in the field of healthy ageing, these exhibitors will be showcasing, and in some cases, allowing you to test their new solutions and looking to discuss and establish collaborations with other actors in the AAL ecosystem. 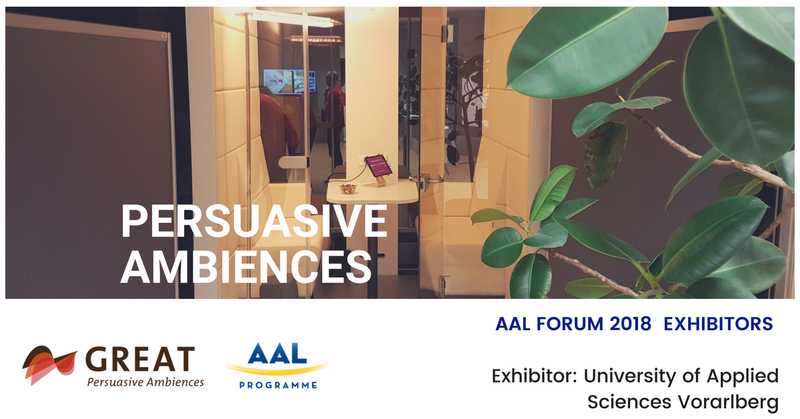 GREAT is the AAL project, coordinated by Vorarlberg University of Applied Sciences in Austria, that will be exhibited at the AAL Forum this year. Get Ready for Activity – Persuasive Ambiences is the very first product that equips a room with light, sound and scent modules to create room ambiences that support people with dementia, at the right time and for the right amount of time. Many people suffering from dementia struggle to make slight changes in their daily structure at home and can become agitated, yet it is possible to induce suitable mood states into the ambience of a room to help them. However, there is usually a lack of individualisation in the application of these types of treatment. Instead, what GREAT does is that is uses technology that gathers data over time to create and continue building calculated light, sound and aroma fitted to individual requirements. Caregivers can also use an app that allows them to positively influence their patient’s erratic behaviour, intervene or set-up and control a specific therapy plan. You’ll be able to see first-hand the many unique selling points this solution offers to those with dementia and the support and control it provides their carers, at the AAL Forum’s exhibition.